UPDATE 12/20/17: Sleeza Bloom apparently was busy during Election 2016, hitting up distinguished pals like Harvey et al to recruit and coach a brothel-full of fake, paid-off weepy Trump victims. Remember Kathy Griffin!?? And recall our plucky girl’s subsequent Harvey’s Changed! movement that backfired, foretelling likely similar success on worthy, upcoming projects . There are overflowing septic tanks and petri dishes with mold crawling up and over the sides more palatable than this woman and her crowd. But she perseveres! UPDATE 11/22/17: Isn’t there some price to be paid by a bottom-feeding lawyer slandering a public figure? UPDATE 10/23/17: Nearly impossible to keep track of the Hollywood Hypocrite Hive. “Feminist” champion Lisa Bloom initially is announced as Harvey Weinstein’s consciousness-raising beard for his very un-PC antics. Ever the money-grubbing publicity whore, Lisa is right there at his side…until she thinks better of it. 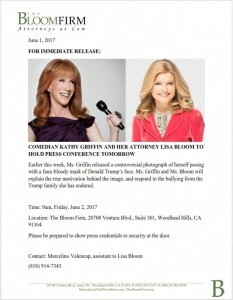 Then Kathy Griffin disowns Lisa. How bad is it when former Lisa client, “female victim” and character assassin Kathy Griffin, won’t even talk to you? Mama Gloria has led the way with a long sordid history of sniffing out financial opportunity from the “feminist” angle and shaking down high-profile gents eager to buy their way out of some or the other woman trouble, genuine or otherwise. MiniMamaMe Lisa has recently earned her own stripes by bringing down Bill O’Reilly and most recently jumping into the Kathy Griffin fray, trying to turn Griffin’s seriously backfired Performance Art assassination of Trump into…(what else? )…an attack by a White Man on yet another Victimized Girrul! Like most outrageously High Hypocrisy from the Left, it’s Because They Can unless and until someone/something stops them. For the Left and its opportunists, freedom is license, and what better licentious forum than a legal system offering the 50/50 chance of getting away with anything. Female? Got a grievance? Something that will attract publicity? Potential big bucks to be reaped? What Jesse Jackson and Al Sharpton are to the Racial Grievance industry, so Gloria and her evil spawn Lisa are to Progressive America’s Permanent Female Disgruntlement (PFD). Litigation Queens and Publicity Whores Gloria and Lisa: their ever-open arms (and greased palms) around some teary-eyed Miss Victim as the cameras snap and extorted payola piles up around them. Such creatures give stature to the $5 hookers of the world.